The annual Conlon Brothers golf outing returned to the Outer Banks for the second consecutive year this spring, and the unusual weather we had last year threatened a repeat performance. The evening before our first round in 2011, a tornado touched down on the mainland just south of Duck, North Carolina. The resulting damage wiped out our scheduled start at The Pointe Golf Club, at Powells Point (252-491-8388). Fortunately, the Pointe is affiliated with the Carolina Club, a bit west in Grandy. We were able to switch play to that course. This year’s evening before our first round was again accompanied by thunder, lightning, and driving rain, but no tornados. However, the rain continued throughout the next day, causing a rare wipeout of the 18-holes we’d planned. The second (now first) round took place in far better conditions, and marked our return to The Pointe. We were told the course lost dozens of trees in that tornado, but after a year’s recovery it was hard to see where the downed trees had once stood. The Pointe was in great shape, especially its bentgrass greens, despite the rains from the day before. I recommend paying attention to the scorecard recommendations for which tees to use, depending on your handicap. They are not kidding. Our next round took place at The Carolina Club, the sister course to The Pointe. One nice feature of playing both courses is the discount applied to the greens fee for the second 18 holes, in recognition of our obvious loyalty. If you are staying in Duck or some other Outer Banks resort community, you should be prepared for a bit of a drive to this club. It’s the rough equivalent to staying in Rehoboth Beach and driving to the Bay Club in Berlin, Maryland. If you really need to warm up with your long clubs, you will also need to stop somewhere along the way. The Carolina Club’s practice range limits golfers to 7-irons or higher. Nonetheless, this course presents some well-defined challenges to its golfers, and local knowledge of its ins and outs is not required. That kindness to its transient customers is to be commended. 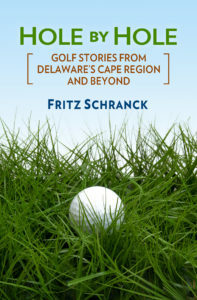 Our third round took place at Kilmarlic Golf Club, in Powells Point (252-491-4220). The good weather we enjoyed after the big storm continued, so the sun shone brightly as most of us butchered our way around this difficult layout. Even from the gold tees, at 6001 yards, the slope rating is a steep 134, with plenty of water and forested areas ready to add to your lost ball count. Two players in one cart in our group managed to lose 20 balls between them in a single round, a Conlon Brothers Tour record unlikely to be topped. Think of a mixture of Bayside and Kings Creek Country Club, on steroids, and you will have some idea of what you face at Kilmarlic. On the other hand, if you can stay in the middle of the fairway, or are an accurate low-handicapper, this course will reward fine play with a real sense of accomplishment. Our last round for 2012 took place at The Currituck Club, a short drive from our rental house in Duck (252-455-9518). We played a scramble format, which with the strong winds blowing helped keep up our playing spirits during the round. This beautiful course winds around the community, presenting great views of both Albemarle Sound and the Atlantic Ocean. A thunderstorm cut short our round, but the offerings in the clubhouse helped make up for missing the last few holes. The Kings Creek CC Ladies 18 hole group played a Team Stableford round June 21. Ana Dittel, Mary Mezger, Marsha McLaurin, and Julie Dickson took first place honors. Vicki Tull, Jan Howard, Jeannine Doan, and Melanie Pereira combined for second place. McLaurin also won the closest to the pin contest on the eleventh hole, with an approach that ended twenty-one feet ten inches away.